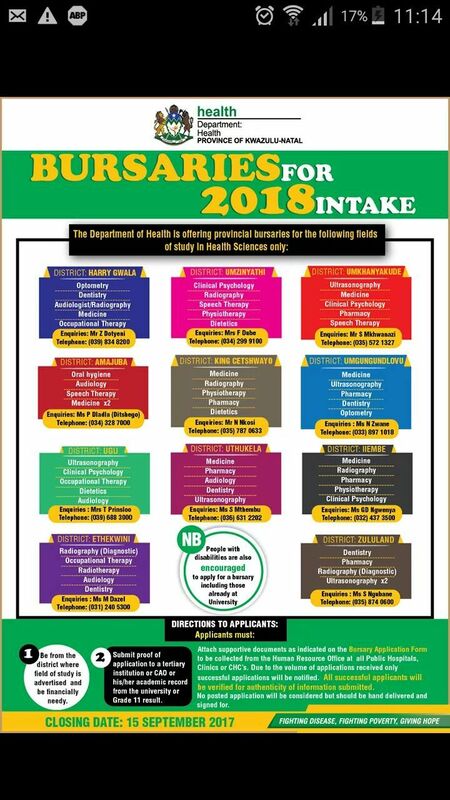 Just in case you missed out on department of health Cuba medicine bursary this year here is another opportunity to get a bursary to study for a degree/diploma in health sciences. Applications for KZN department of health bursaries for 2018 are open and will close on the 15th of September 2017. If you are studying or wish to study medicine, clinical psychology, radiography, speech therapy, physiotherapy, dietetics, occupational therapy, audiology, oral hygiene, pharmacy, and ultrasonography please contact the numbers in the advert below to enquire some more. 3. You must submit grade 11 results (and probably your latest June exam results) and proof of application to a tertiary institution if you are still in Matric, an academic record if you are already at university. 4. Bursary application forms are to be collected from all public hospitals, Clinics and CHC’s ( so go enquire at your nearest public hospital or district department of health offices. 5. Applications are to be hand delivered and signed for. 6. Only successful applicants will be notified due to the large number of applications. 7. Further details on documents to attach will be on application form. You may also be interested in reading this interview with Dr Luke Sampson to get insights about becoming a doctor in South Africa. I hope some of you will take this opportunity to apply so you can serve your communities in the near future. Please share this post and subscribe to SA Varsity Student via email.